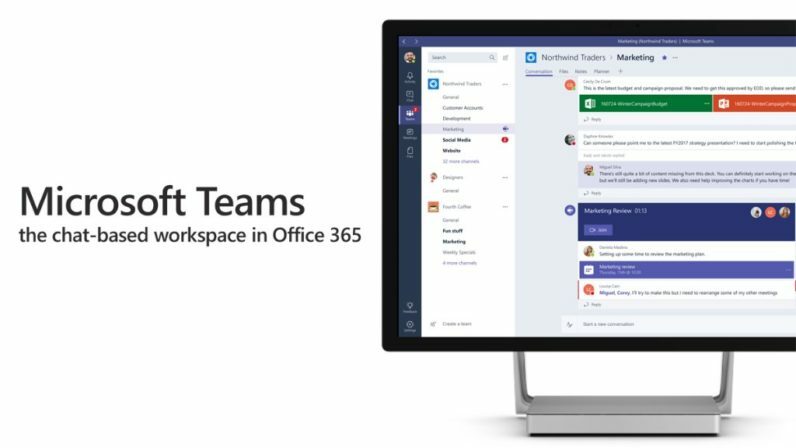 At an event in New York today, Microsoft announced Microsoft teams, its Slack competitor, following months of rumors and speculation. CEO Satya Nadella described it as a “chat-based workspace,” meant to unite teams for both casual conversation and productive collaboration. The app will bring together Office apps, notes, Power BI, Skype and more all in one piece of software that can be used across a variety of devices. Basically, Microsoft wants Teams to serve as an amalgam of all of its Office 365 products, instead of having to constantly to switch between various productivity and communication apps. There’s also a feature called ‘Tabs,’ that allows you to integrate various cloud services (Microsoft hasn’t clarified which services yet, but think Google Drive, Box, and Dropbox). There are multiple similarities to Slack at first glance. The various teams are akin to Slack’s channels, and they bold up and show a notification count when there’s activity in the group. You can send GIFs via Giphy, it has an integrations analog called ‘Connectors’ and you ping specific people using an ‘@’ symbol. One bit where it’s different from Slack: Threaded conversations. Thank goodness. It also provides richer access to documents – if you use Office, anyway – integrating a full-fledged editor via Office online, integrated right into the app, although you can also open documents in local applications as well. Bots also appeared to be a bit more powerful, leveraging Microsoft’s Bot Framework announced at Build earlier this year. A bot called ‘WhoBot’ allowed you to inquire about who you should contact in your company if you need help with a specific task. I.E. if you’re not sure who the designer on your team is, you can just ask the Bot. Perhaps the most interesting bit is that Microsoft is emphasizing Teams as an ‘open’ workplace, meant to replicate interactions between people in the real world. For instance, you could hold a Skype call with a team, but leave it open such that anyone can access it. You’ll see that there’s an ongoing Skype call within Teams and can choose to join in even if you’re not part of the group. Of course, you can make the calls invite-only as well, but it’s a neat way to keep your online workspace a bit more friendly. Teams opens up as a customer preview today in 181 countries and 18 languages, and will launch with general availability in Q1 2017.